Our Group enjoyed the “Christmas Do”, especially sharing the platform with the Ukulele Group. We understand that the “gig” was much appreciated. Having got that one under our belt, Margaret has started preparing “The Carnival is Over”, “Dancing Queen”, “Fernando”, “Till There Was You”, and “True Love Ways” for us to go alongside our ‘standards’ such as “Yellow Bird”,” Hernando’s Hideaway”,” Let It Be” and “Amazing Grace”. Come along and have some fun with us – there is plenty of laughter, especially from the ladies in “Delilah” ! “Your Group Needs You”, especially the chaps. We are greatly outnumbered by the “chapesses”. 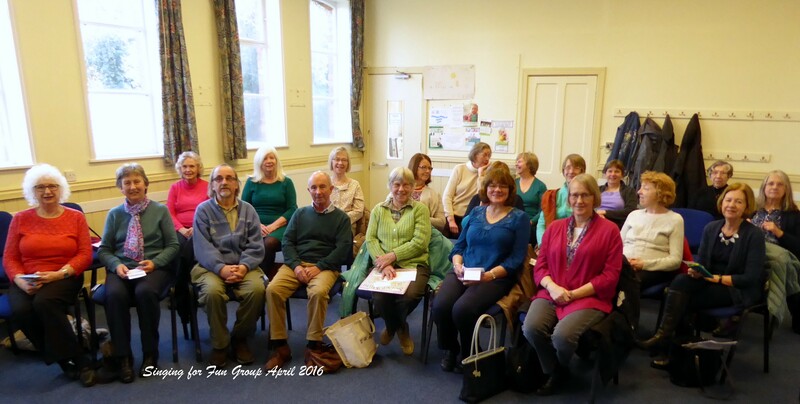 We meet monthly on the 4th Thursday in the Church Hall, 10 – 11.30. The singers got together with the ukulele group for the Christmas Open Meeting, singing favourites such as When the Red, Red Robin, Go Tell it on the Mountain, Calypso Carol and Jingle Bell Rock. We also sang Silver Bells and the beautiful O Holy Night. Our efforts received warm applause and the final We Wish You a Merry Christmas also had audience participation. All are welcome to join us in 2018. The Singing for Fun group made a successful first public appearance at the Christmas meeting. We sang While Shepherds Watched and were ably supported by the Ukele group in Jingle Bell Rock, Calypso Carol and Winter Wonderland. We rounded off our performance encouraging the audience to join in with We Wish You a Merry Christmas. We’re looking forward to our next public performance at the Group Fair in March. Our recent sessions have included practising for the Christmas concert which will see our first public performance. We will be ably supported on the day by the Ukulele Group and we enjoyed the chance to sing with them in September. With each session, we’re becoming more confident and adventurous in what we do encouraged, as always, by Margaret. We’re now becoming used to singing together and adding more numbers to our repertoire. Particularly we’ve enjoyed singing Amazing Grace and other songs which allow us to have a go at harmonies, since we have some good male and deeper female voices. The men also contribute some excellent whistling during Always Look on the Bright Side of Life. In addition, we’re discovering the inner Latin in us with Hernando’s Hideaway. We do have a waiting list but we’d love you to join us and enjoy the fun. We’re singing such goodies as: Oh What a Beautiful Morning, The Wonder of You, On Ilkley Moor Baht ‘At, When the Saints go Marching in, Amazing Grace, Hernando’s Hideaway, and There is a U3A in Town (written by me to an old familiar tune). We were snapped getting into the mood to sing. A start up meeting took place on Wednesday 6 April. The first of the regular monthly meetings will take place on Thursday 26 May 2016 in the Guild Room at Chilwell Road Methodist Church at 10.00 am. Future meetings will be on the 4th Thursday every month.